Whatever happens this year this will go down as one of the wins of 2016. Last week Vaughn Taylor was playing on the Web.com Tour in Colombia when he picked up a stomach virus which was so bad that he needed an IV and pulled out after a few holes. He then only flew to California instead of home to Georgia because the flight was cheaper and he had a stand bag with him to avoid the additional baggage fees. And then he only got into the tournament when Carl Pettersson withdrew. And then he won, closing with a 65 which included four birdies on the trot from the 13th in a back nine of 31. His final birdie, at 16, came from 30 feet and he was almost at the hole before the putt dropped. There were good chances at the last two holes but the putts either came up an inch shy or slid by but the good work had been done. Phil Mickelson needed two birdies to tie, he made the first from around 15 feet at the 17th but then lipped out from a third of that distance at the iconic 18th. 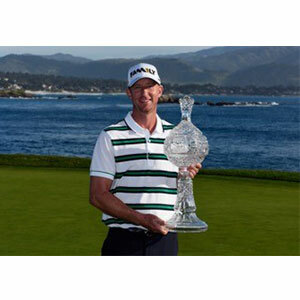 Taylor, who last won 11 years ago, had his PGA Tour card back along with a cheque for $1.26m. In April he will play in his local area tournament, the Masters. Sweden’s Jonas Blixt took third while Justin Rose tied sixth with the in-form Patrick Reed. What Taylor said: "I just kept working, kept grinding. And I can't believe it actually happened. You get out here, and you have success, and you expect to have it all the time. And that's not really the way it works.